The building in Kyoto, Japan sits on a serene pond, which reflects the beauty of the Golden Pavilion and forested backdrop. This creates one of the world's loveliest settings. Long before the camera was invented, the Golden Pavilion became a prized subject for Japanese artists. The resulting artistic exposure soon lured countless Japanese to visit Kyoto to view the striking Golden Pavilion firsthand. Today, it draws tourists from around the world. The Golden Pavilion was built in 1397 by the then ruling shogun. On his death, it became a Zen Buddhist temple. Disaster struck in 1950. The Golden Pavilion was burned down to the foundation by an arsonist (a fledgling Buddhist priest). 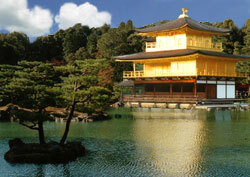 The Japanese rebuilt the Golden Pavilion in 1955, faithfully following the original design. The major change was in significantly increasing the amount of gold leaf applied to the Golden Pavilion's exterior and interior.